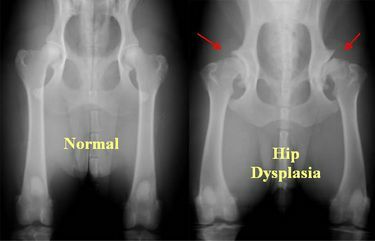 Hip Dysplasia (HD) is known within the Lagotto Romagnolo breed. Ethical breeders test their breeding dogs and use dogs with appropriately low scores in their breeding program. The breed average for hipscores in Lagotto in Australia has improved over the short time the dogs have been in the country because of this testing. Testing involves the dog having xrays of the hip area while under general anaesthetic. The xrays are then sent on to a specialist who will read, assess and score the different parts of the hip joint resulting in a total number somewhere between a perfect 0 and the worst outcome of 106. Sometimes these numbers are also expressed in the International grading of A, B, C etc. At the same time as the HD is tested, elbows are xrayed for Elbow Dysplasia and these are scored by the specialist also.